Wheelchair Scale w/Eye-Level Beam - Measures in Lbs. ** Product Options-> Option: Measures in Lbs. 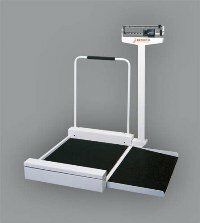 ** This Detecto Wheelchair Scale w/Eye-Level Beam has a ramp is designed for a smooth approach and exit.